On my quest to try all things CBD, I came across vetted vendor NuLeaf Naturals through r/CBD. My hopes were high as I awaited the package to arrive. One review on Reddit had me particularly excited–the user reported overall general satisfaction. Dosage: The package came with a paper stating most customers found 10-20 drops to be an effective dose, but that optimal dose would vary by user. I’m one of those varied users (see Overall Experience below). Knowing that I’m quite sensitive to supplements in general, I started out with 5 drops around 8 pm. 5 drops proved to be too much–after about 10 minutes my eyes became red and I felt extremely off. I had planned to get some work done before bed, but sluggishness began to settle in and as the CBD reached peak effect, the brain fog became more apparent and I felt unable to do anything productive besides read and watch YouTube videos. I noticed a decrease in anxious thoughts, but that desirable effect was offset by the unease I felt about not being able to do work. After the initial test of 5 drops, I tried varied doses. I found my sweet spot to be around 1-2 drops, paired with some caffeine (if taken during the day). I’d re-dose every 2-4 hours-ish, if needed. 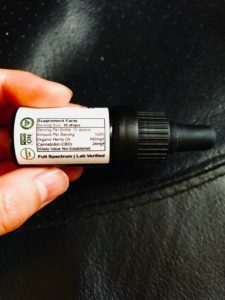 With 1-2 drops, I was able to focus and work without the caffeine exacerbating my anxiety. However, the red, dry eyes persisted, and proved to be very uncomfortable. I found myself constantly reaching for eyedrops every hour or so, which didn’t really abate the issue very much. Note that I suffer from dry eyes in general, but I usually don’t use eyedrops, or if I do, I only need it 1-2 times a day. As for insomnia relief, NuLeaf Naturals CBD didn’t really help in that arena. There was definitely a relaxation effect where I felt less aggravated about not being able to fall asleep, but no significant effect in helping me actually fall asleep. Overall, the negatives outweighed the positives for me. 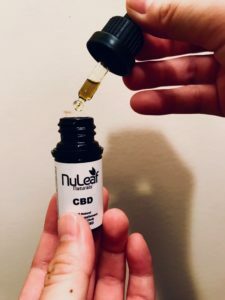 Given that some users have reported more positive effects, I still think NuLeaf Naturals CBD is worth a try. Buy here! NuLeaf Naturals seems effective for anxiety but not for insomnia. If you've also tried CBD from NuLeaf Naturals, submit a rating below or comment!